Of East Sparta, died January 14, 2019 in the same house which he was born 99 years 8 months ago on April 21, 1919. 1937 East Sparta High School graduate where he was basketball team captain. East Sparta Christian Church immersed member since 1933 where he taught Sunday School 50 years and was awarded Elder Emeritus. 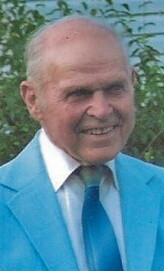 Marvin Founded the Marlesco Holstein herd in 1938 culminating with the first red and white Holstein to ever be Grand Champion at the 1983 Ohio Holstein Show. Marvin operated the farm business on two Ohio State Century farms, 1890 and 1904. An Ohio State representative as state director of the Ohio Holstein Association. Marvin founded the Cook Tractor Museum, an array of 50 antique tractors from all over the United States and Canada. Marvin was a Master of both Pike Grange and Pomona Grange. Charter member of the Stark Soil and Water Conservation Board. Pike Township Historical Society Historian. Marvin’s exploits garnered him 2007 East Sparta Man of the Year and listing in Ohio Live’s of Contemporary Leaders in Ohio. Marvin is survived by his wife Dr. Martha Cook to whom he was married 69 years, Mark, Terri, Rachel, Tyler, Morgan, Ryan (Andrea) Cook. Funeral services will be Friday January 18, 2019 at 11:00am in East Sparta Christian Church with Pastor Tim Carlson officiating. Burial will be in Melscheimer Cemetery. Friends and family will be received Thursday 6-8pm in the Kreighbaum-Sanders Funeral Home and one hour before services on Friday at the church (10-11am). Memorial donations may be made to East Sparta Christian Church at 9429 Main Ave SE., East Sparta, OH 44626.